The new Community Falls Service will offer advice and assessments for people who have recently fallen, or who are at risk of falling. It has been commissioned by NHS North Tyneside Clinical Commissioning Group and is being launched by partners from The Newcastle upon Tyne Hospitals Foundation Trust, TyneHealth Ltd, North Tyneside Council, Age UK North Tyneside, North East Ambulance Service NHS Foundation Trust and the Tyne and Wear Fire Service. The service will offer a community falls clinic (managed by Newcastle Hospitals and the and North Tyneside GP Federation), Safe and Well Checks (by Tyne and Wear Fire and Rescue Service (TWFRS)), strength and balance courses (provided by Age UK) and Falls First Responder service provided by North Tyneside Council and the North East Ambulance Service. Falls and related injuries are a significant problem for older people. 30% of people over 65, and 50% of people over 80 have at least one fall in a year, with one fall in twenty leading to hospital admission and one in ten causing significant injury. Cllr Gary Bell, cabinet member with responsibility for Adult Social Care, said: “The health and care of our most vulnerable is a top priority for North Tyneside Council, so we are delighted to be part of this initiative. “The 999 service will be directly dispatching our team to members of the public – in the same way they would direct an ambulance – to help those who don’t require emergency medical attention but may need assistance getting up after a fall, treatment of minor injuries or other support. Our team will be able to link into community health services to attend to minor injuries at home, preventing the need to attend A&E. 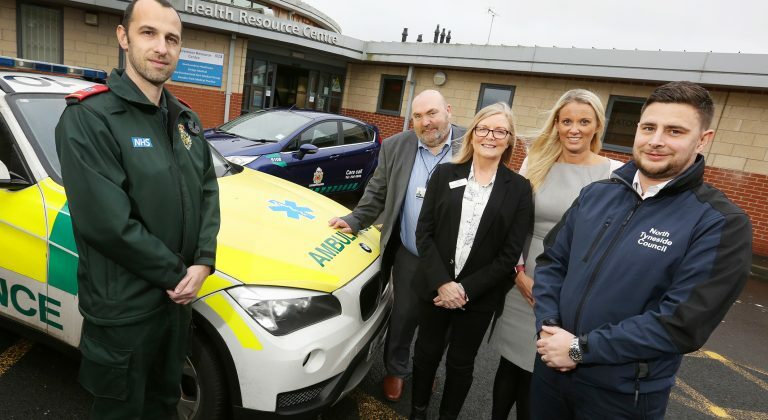 “Like many public sector organisations, the ambulance service is facing growing pressures, but we hope by providing a dedicated falls team and a vehicle, it will help to free up ambulance staff to deal with emergency cases. Within the first 12 months of the service being operational, it is expected that around 1,000 patients will be seen. Similar services have proven effective elsewhere in the country and it is hoped that the new service will have similar success. “There are many risk factors in dying through a house fire. Living alone and limited mobility are just two – but at this time of year they are the most prevalent, with bad weather often keeping the most vulnerable in our community indoors and isolated. “Through our Home Safety Checks we are able to identify and support individuals who fall into these categories. Our fire safety advice helps to prevent tragedies occurring. Dan Haworth, Advanced Practice Manager at NEAS, said: “A fall is the fourth most common reason for requesting ambulance assistance, particularly in the older population, with people aged 65 and older having the highest risk of falling. “As an emergency service, our priority must always be to those patients who are in a life threatening condition. As a result, this can unfortunately mean some patients whose lives are not imminently at risk, such as elderly fallers, may wait longer for an ambulance than we would like. “Welcoming Care Call into our team of first responders not only allows us to provide a better experience for those patients who have fallen without injury, but also increases our ambulances’ availability to attend life threatening calls. Dr Steve Parry, Clinical Lead at the North Tyneside Community Falls Prevention Service clinic, noted: “Instead of waiting for people to fall, we will be proactively looking for older people at risk of falls, as well as those who have already had falls, blackouts, dizziness and balance problems while also seeing referrals from partner services who come into contact with older patients. As a patient, you can be referred to the falls service by any health or social care professional, or you can self-refer if you have any concerns.